We live in a hyperconnected world. Artificial Intelligence and Machine Learning have replaced Big Data as the buzzwords of 2016. If I hear AI I think of movies like “HER” or “Moon” or “2001: A Space Odyssey”. But, AI is reaching a tipping point from being the focus of clever movie plots to a tangible business reality. This is thanks to the access and the ability to crunch petabytes of data and the low cost of high power cloud computing. Gartner already predicted last year that "by 2018, 20% of all business content will be authored by machines". While no one is expecting parity with human intelligence today or in the near future, AI has big implications in how we live our lives. You might not even notice it, but AI is already part of many elements of your day to day: Siri does natural language processing on your iPhone. Spotify, Amazon and Netflix use machine learning to suggest songs, products or films you might like. And when Facebook knows who is in your photos, before you tagged your friends, that is deep learning at your fingertips. What does AI and machine learning mean for businesses today? For the majority of businesses, Artificial Intelligence has been mostly out of reach, because it requires a lot of hidden processes, and data scientists doing data prep and modeling. Now, we wouldn’t be Salesforce if we didn’t strive to change that. You may have already read or heard a few hints here and there about our new product called “Einstein”. Well, no more hints! Today is the big day and we are officially launching Salesforce Einstein to the world. And that means we can finally provide you with further details. Salesforce has embarked on a journey of being the first to bring the power of artificial intelligence to every Salesforce user, empowering them to be their best. With Salesforce Einstein, the #1 CRM becomes the World's Smartest CRM. We have been making lots of investments in AI technology, spending over $600m to bring together various components. We’ve put AI into the core of our platform to learn from all sorts of data - empowering everyone to discover insights, predict outcomes, recommend next steps, and automate tasks. What makes it so special is that Salesforce Einstein is 'Data Ready'. So our customers don’t have to do any data preparation or ETL. They just put the data into Salesforce and it works. With Salesforce Einstein, AI capabilities will be pervasive across every Salesforce Cloud because it is an integral part of Salesforce’s trusted, metadata-driven and multi-tenant platform. It leverages all data within Salesforce - customer data; activity data from Chatter, email, calendar and e-commerce; social data streams such as Tweets and images; and even IoT signals - to train machine learning models. And because Salesforce has millions of users inputting information every day, it is uniquely positioned to deliver the best models for sales, service, marketing and more. Sales Cloud Einstein will include Predictive Lead Scoring that enables sales reps to focus on closing the best leads, Opportunity Insights that alert reps when a deal is trending up or down, and Automated Activity Capture which seamlessly logs email and calendar activity with the right Salesforce record, and analyses them to deliver predictions. Service Cloud Einstein will include Recommended Case Classification which automatically pre-populates key case fields enabling predictive routing of cases to the right agent and enabling agents to resolve customer issues faster. With Recommended Responses service agents will be pushed the best responses, and Predictive Close Times will predict the time needed to resolve an issue, helping improve agent productivity. Marketing Cloud Einstein will iinclude Predictive Scoring which scores every customer’s likelihood to engage with an email, Predictive Audiences which builds custom audience segments based on predicted behaviors, and Automated Send-time Optimisation which predicts the optimal time to deliver messages based on past customer behaviour. Commerce Cloud Einstein includes Product Recommendations to personalise product recommendations to shoppers, Predictive Sort which will infuse personalised sort and search results based on likelihood to engage, and Commerce Insights that will help retailers understand product purchase correlation to power smarter merchandising and store planning. Community Cloud Einstein now includes Recommended Experts, Articles and Topics to suggest posts, articles, experts and topic pages; Automated Service Escalation which automatically creates a case in Service Cloud if customer posts do not receive a timely response; and Newsfeed Insights which highlights the most relevant and popular content in every feed. Analytics Cloud Einstein will deliver Predictive Wave Apps that uncover future patterns for any business process, Smart Data Discovery that helps users find and explain insights from millions of data combinations in minutes, and Automated Analytics & Storytelling which will automate and prioritise the next insight users need to know. IoT Cloud Einstein will include Predictive Device Scoring which will score data from connected IoT devices, Recommend Best Next Actions for service processes and marketing journeys based on the scoring of that streaming device data, and Automated IoT Rules Optimisation which will actively update the rules that govern how IoT data is managed. 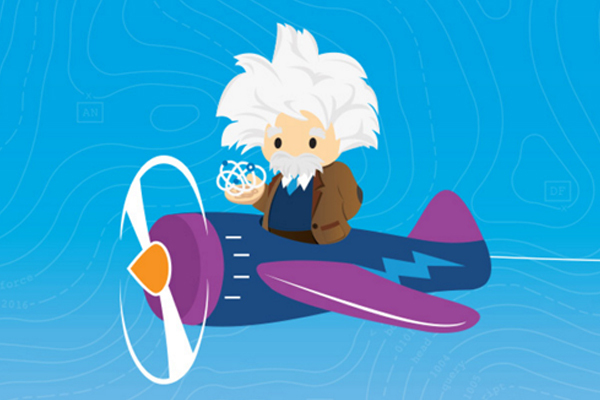 As a core part of the Salesforce Platform, Einstein will empower everyone to quickly build AI-powered apps using the tools that millions of Salesforce developers and admins already use every day. With just a few clicks, admins will be able to quickly build apps that include Einstein-powered fields in any object, page layout or workflow, making every business process smarter. And for data scientists and developers, there will be Predictive Vision and Sentiment Services which enable developers to train deep learning models to recognize and classify images and sentiment in text. And PredictionIO in Heroku Private Spaces will empower developers to build custom machine learning models and put them into their apps. If you want to learn more about the detailed features powered by Einstein, visit www.salesforce.com/einstein and subscribe to this blog. We will be launching a series of posts that will go into much more detail about what Einstein means for each of our core product lines. Stay tuned! In the meantime, you can also start exploring the Einstein Trailhead to learn more.